One of the Modern Scholar's most popular lecturers, Professor Timothy B. Shutt of Kenyon College examines the contributions of the peoples of northern Europe through their vibrant literary legacy. As Professor Shutt's textual analysis reveals, Celtic and Germanic values shine through these works, exhibiting such characteristics as courage, self-control, and respect for women. As listeners will find, the legacy of the European Northlands formed a cultural pattern that continues to this day. I was a little disappointed when I first started listening to this audiobook because, well, I'm not sure how to put this, it isn't one. Without wanting to give definition, I would tentatively say that an audiobook is an audio version of a printed book. What you get here is a series of lectures. I thought about stopping once I realized this but I'm glad I didn't. This is a very introductory level lecture series on the Celtic and Germanic traditions and how these traditions seep into European culture. Again, there needs to be caution. 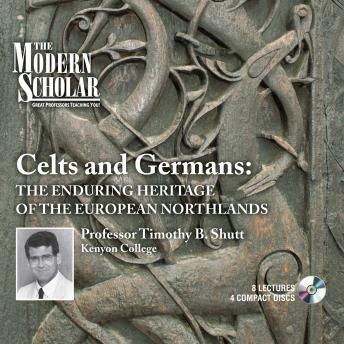 This is not a fully researched history drawing upon multiple sources to give an account of how the Northerners lived but a look at a series of books that have survived and how these books have given insights into Celtic and German culture and how these insights can be seen to be at work in European culture. Again, on might be disappointed but again I ultimately wasn't. Shutt seems knowledgeable although I'm certainly not qualified to judge. His voice is a little annoying at first but persevere and he is shown to be an engaging and entertaining story teller. He moves from the very oldest surviving text talking about the history of the texts themselves, then giving an account of the story before suggesting what is the enduring legacy. Informative, entertaining and enjoyable. Not a classic in audiobooks but I found it to be worth my time. I'll definitely look into this fascinating subject matter further.